rolled up in the job of Mother. "In these sacred responsibilities, fathers and mothers are obligated to help one another as equal partners. Disability, death, or other circumstances may necessitate individual adaptation. Extended families should lend support when needed." For today's project, I created a "Mother's Nurture Bag". 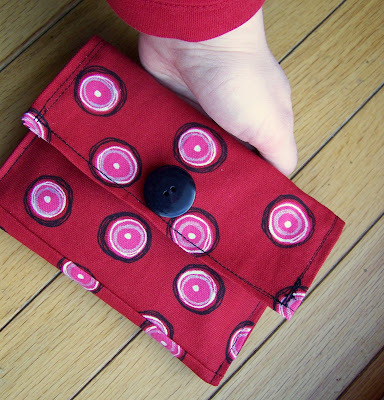 It's patterned after a no-sew make-up bag that I saw online yesterday. but it's still very easy to make. Here's how I did it, if you'd like to make one of your own! Cut a piece of sturdy material measuring 14 x8 inches. Then cut it into two pieces measuring 9 x 8 and 5 x 8. Place right sides of the fabric together and sew along the bottom/8 inch side. Fold over the edges and iron to create a finished edge. Sew all the way around your piece. Using a complimentary fabric, cut a 13.5 x 7.5 inch piece. Fold, iron, and sew around to create a finished edge on this piece as well. Then place the wrong sides of the fabric together and pin. Sew across both 8 inch sides. Now fold your project from the bottom up to create the pouch. Carefully sew along the sides to enclose the bag and attach the rest of the liner. but I sewed a decorative button on the front. So, I hand-stitched the word "nurture" where only I would see it. And my basic make-up bag suddenly became my "Mommy's Nurture Bag". and some mini-love notes (made by my sister). and more items to nurture yourself as well. Tuck this in your bag and you're good to go. will be called upon to save the day. And now, I'm going to do something really nutty, because I'm just crazy like that. 1. Sew three different projects. but not one you've already finished. 2. Post a tutorial for each on your blog on the due date. The projects are due on these three Mondays: Feb 1, 8, and 22. 3. I'll post photos and links to all three of the projects on the same day. and will earn herself bragging rights within the family. The gauntlet has been thrown...will they accept??? (Ha! In a post about "nurturing" I just used the word "Smack-down"! SUPER cute project! By the way, your sewing skills are not REMEDIAL!! CRAZY GIRL! YEAH, I need to accept b/c I heard that the prize was a new computerzied sewing machine! Only...you aren't giving me much time as there is no school on Friday to get this done! Great Project the fabrics are great,Woderful idea. Love this idea, Jocelyn!! Thanks for linking @Creative Itch's "Sew Cute Tuesday"! So cute! Love it! I really need to be more crafty. My band-aids are just shoved in my purse pocket. that's really cute, band-aids can be an instant healer in themselves because of their designs, etc., but kept in something like that would take it to a whole new level!